Discussion: What Else Should We Do to Reduce Violence in Our Communities? President Toni Preckwinkle continues to combat violence in Cook County communities. A University of Chicago Crime Lab report showed that violent crime arrests dropped 51% among at-risk youth who participated in the One Summer Plus 2012 anti-violence program. Click below to join the discussion. An inside look at the One Summer Chicago program. Topic: What are Your Ideas to Prevent Violence in Your Community? Cook County President Toni Preckwinkle has worked to reduce the violence in cook county communities since taking office. She has established a Violence Prevention Advisory Committee, awarded $2 million in grants to community-based anti-violence programs, is working with Cook County Sheriffs to curb illegal gun possession , banned assault weapons and toughened penalties, and has collaborated with Mayor Rahm Emanuel to start One Summer Chicago. One Summer Chicago is a joint effort between the City and County that provides Chicago’s youth with summer job opportunities and activities designed to enhance personal development and learning in a safe environment. 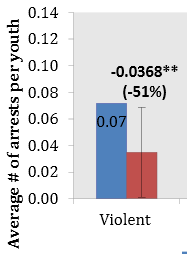 According to an August 8, 2013 study by the University of Chicago’s crime lab, the program reduced the violent crime arrest rates by 51% among the at-risk youth involved. Click here to read the U of Chicago Crime Lab report.